As I was setting myself up for game development, I soon realized that I needed to start small again. After all it had been some time since I last developed software hands-on. As I had heard about the possibility of creating an HTML5 game for Facebook Live Video, this seemed like an ideal first project. A Facebook Live game can have a big viral impact, because it uses comments, likes and shares to control what happens in the game. This I hoped to use to increase the number of followers of Crafty Guppy on Facebook. You can have differences scenes in your game, with transitions between them. Adding animation and sound is also a breeze. The code below loads background music and plays it. It looks very straightforward, and it is. Much easier than MonoGame, where you need a Content Pipeline to convert all assets to the proper format before the build. A Facebook Live Video game should be very simple in nature. The idea is that the game environment itself is a video. The Facebook user can influence what is happening in the live video, by performing actions on the post. For example posting a comment, sharing, liking of tagging. These kinds of actions can be retrieved using the Facebook Graph API. My game is about two groups of mechs: the Empire vs the Rebels (a cheeky homage to Star Wars). The mechs move and shoot by themselves, but you can join by commenting ’empire’ or ‘rebels’. I also wanted something to incentivize a share, so I opted for an ‘Air Strike’. Every 10 minutes the side with the most kills would win. For the graphics I used stuff from OpenGameArt. When starting development of this game, I did not expect to run into any performance issues. It is a simple 2D game which could have been made in the 80’s. With today’s hardware, easily playing HD video and rending complex 3D effortlessly, I thought that my super simple game would be super fast. But no. I actully saw things slowing down and have a low framerate. Even though I had only several sprites on the screen. Since I was using Visual Studio and TypeScript, I had to use Internet Explorer for debugging. Right now it is still the only browser that supports TypeScript debugging. Go figure. But even in other browsers you clearly see that the HTML5 canvas technology is not very optimized (yet). This was a set back. Even though my game was simple, I had to be very aware of the number of sprites to render and animation and so on. But I did manage to finish the game as I wanted it. Mostly because Phaser is such an easy framework to use. When I had my game ready, I tried broadcasting it on Facebook Live Video. This uncovered a couple of new issues. To broadcast, I used OBS Studio, which works great. But after the first tests, I saw that the game works really slow on the HTML option that OBS Studio provides. Luckily broadcasting a part of the screen is much faster, so I could use that. But this is a bit weird, because if some window opens on your PC, it is visible for your users watching the stream. I also had a problem with my initial idea of letting the mechs respawn after you tagged a friend. For Facebook Live Video, tagging does not work in the mobile app. Strange but true. So I decided to remove that feature. The share functionality was also not working properly. As it turned out, you can only read shares that are on your own page, which makes this practically useless. Because you can read the number of shares, I refactored the airstrike to be a random one once the number of shares of the post increased. That way it was not necessary to know you made the share. Not a desirable solution, but better than not having a share action at all. 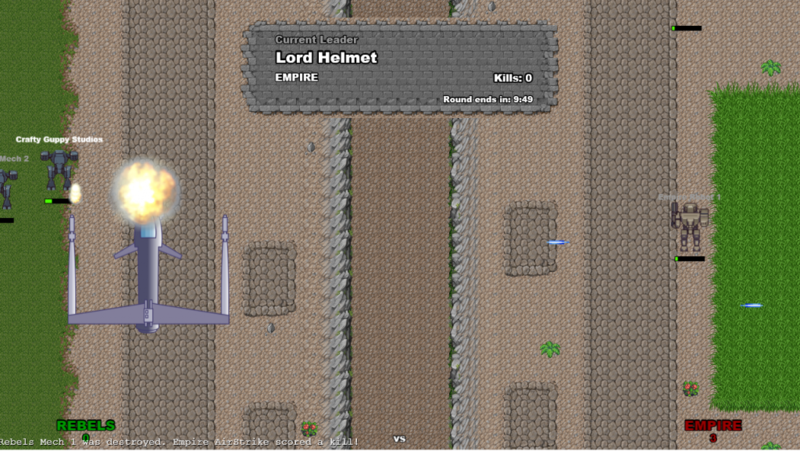 The game is now finished, aside from the issues I found running the first tests on Facebook. So far the biggest problem is, that the lag between the user action and what happens in the video is sometimes more than 30 seconds. This is Facebook’s fault, unfortunately. This makes the game not as powerful as it could have been. I’ll do some more testing and report back once the first real live video’s have been broadcasted!